I absolutely love dressing up, even now as an adult. I mean, today is our Costume Contest at work and I'll share pics of my costume tomorrow and probably Instagram throughout the day today so make sure you're following me. Kerry touched on this last week when she shared her costumes. 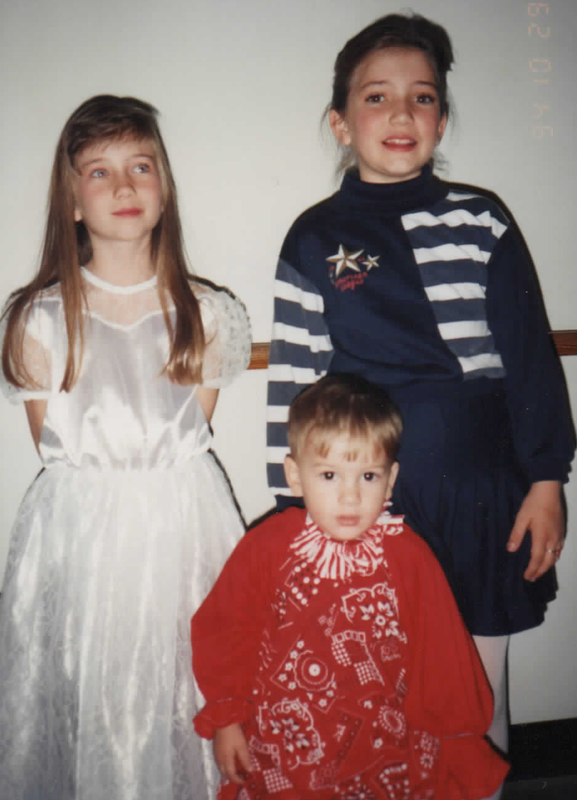 We too had one child size costume that managed to be worn by each of us three kids and my mom had a coordinating costume to wear with us. 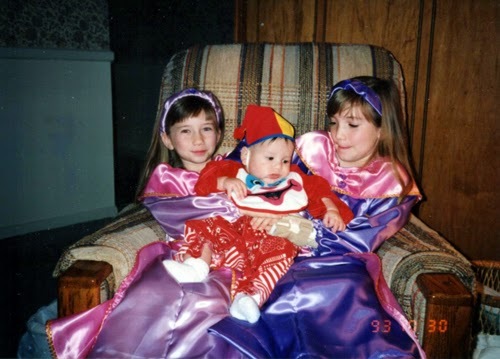 I remember these clown costumes like it was yesterday. 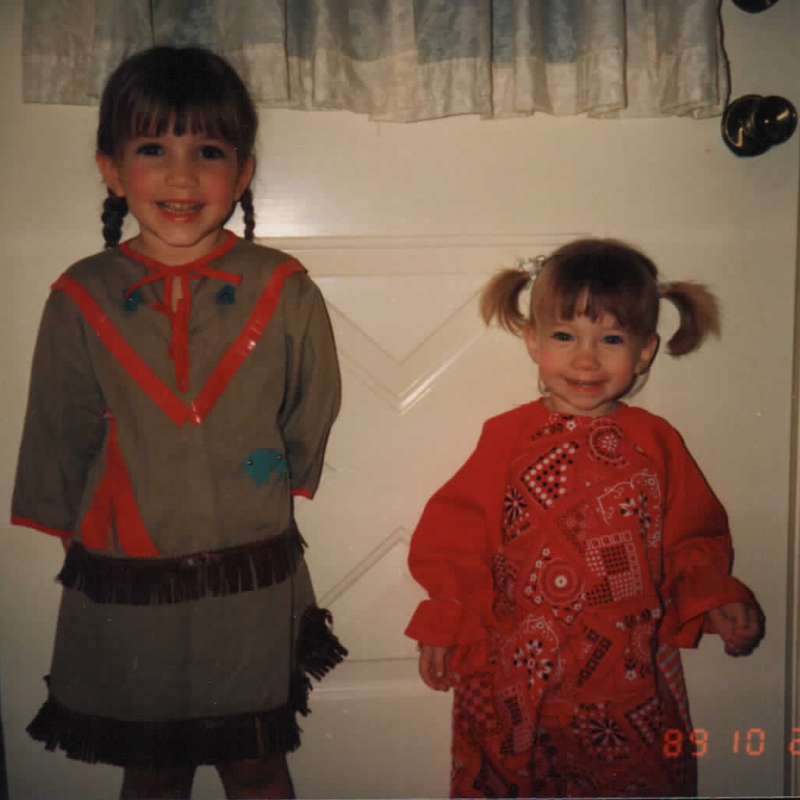 I did not remember the Pocahontas / Indian costume until I saw this picture but I remember it now. 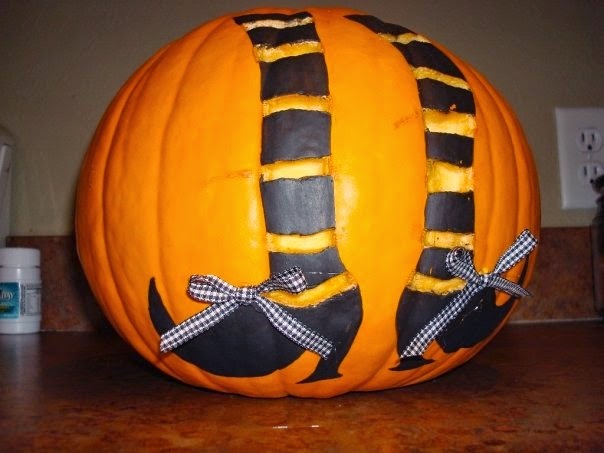 Especially my little moccasins! 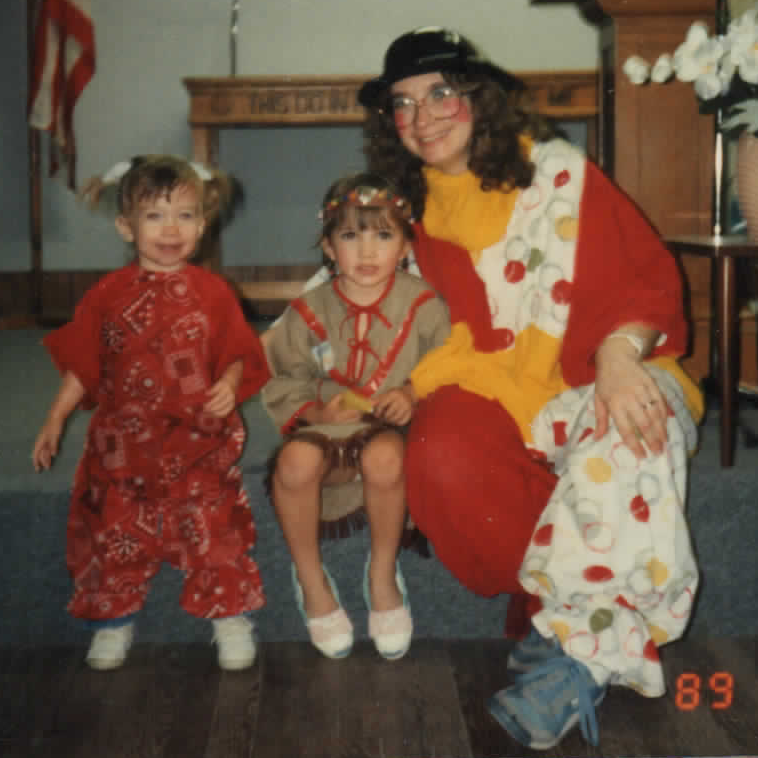 Mom and I weren't able to find the picture with me in the clown costume though because we had so few pics from those years and NONE around Halloween. 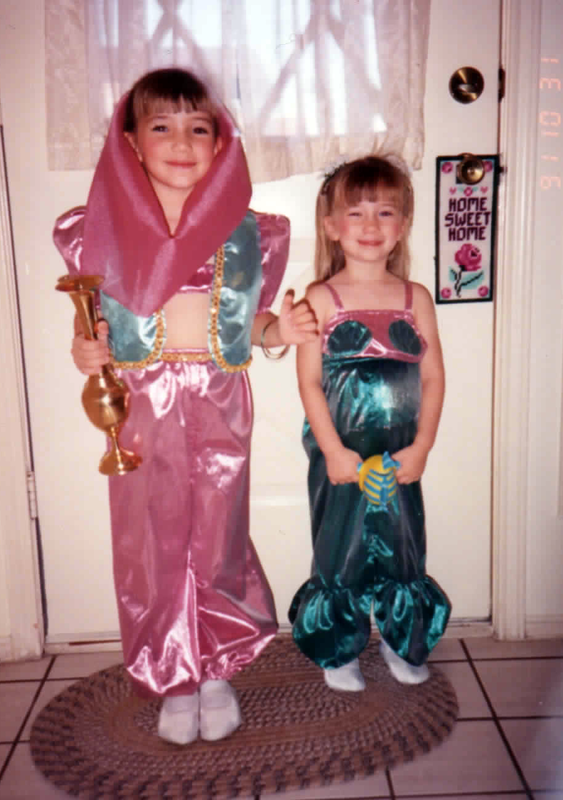 One of my absolute FAVORITE outfits was the genie costume. We had a school play where we needed a genie and somehow I managed to beat out another girl for the part. I was in HEAVEN! 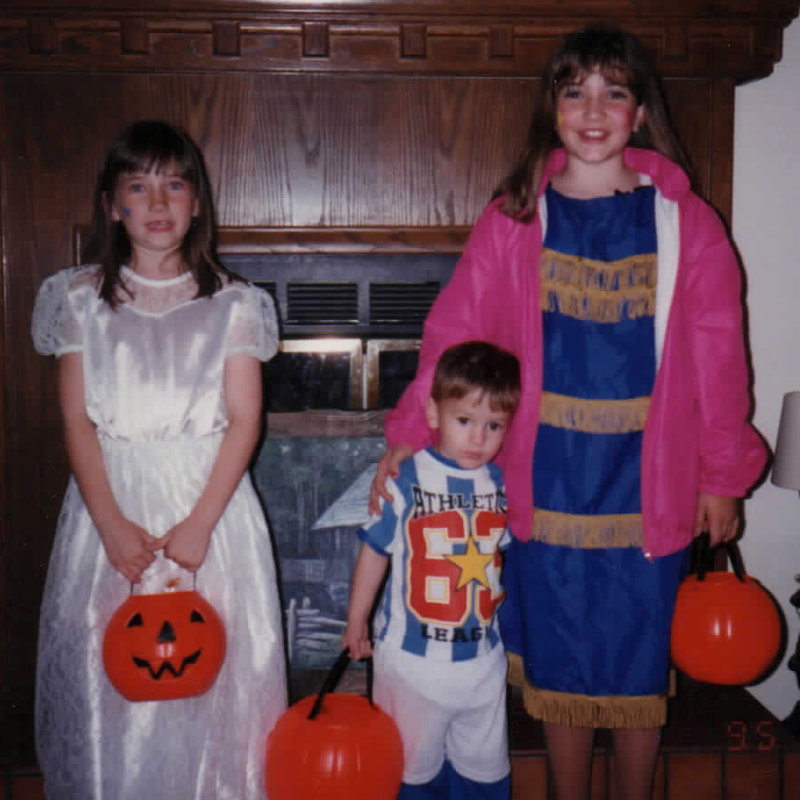 Then of course I had to wear it for a year or two for Halloween and dress up! 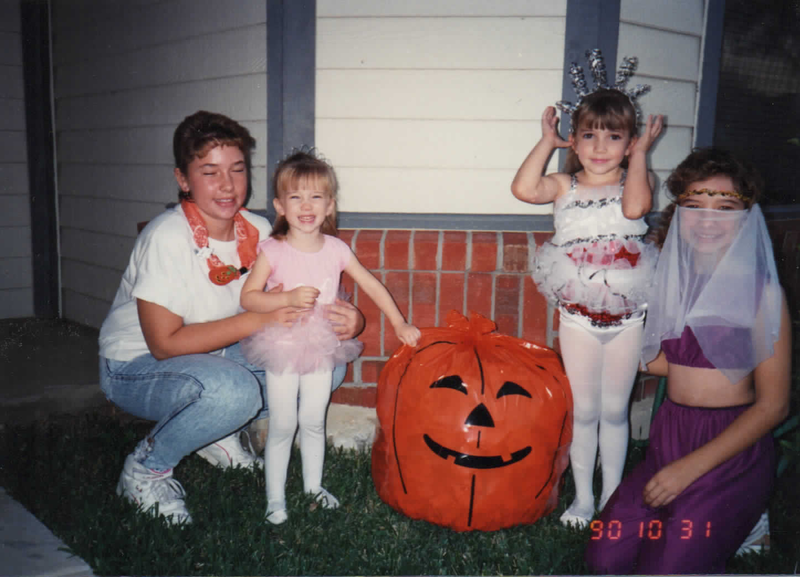 Some other fabulous costumes we rocked through the years! I do a lot of these rambling types of posts, but I think this is my first Life Lately post. I've known about NaNoWriMo since 2010 when a lot of my friends from the Fanfiction community were looking at writing Original Novels. It's something I've wrestled with and thought about doing since then but never actually committed to it. Well, after seeing Chelsea's posts about it I decided to sign up for real! Apparently I'm just going all out this year. I have an idea I've been sitting on and I've been working on getting some of the planning done so I can just start writing on November 1st. That means a lot of things will be going on outside my blogging life and I'm going to try to post only 1-2 times a week which I've kind of been doing for the last few months anyway with my design business taking off. I got some more exciting leads from that too, so to say this girls is all smiles and on the verge of overwhelmed is an understatement. I know I can do this, it's just been about four years since I've written more than a blog post or one-shot (shorter than a short story). I also tend to get carried away with the visual side and will have little time to play with that side if I want to finish the 50,000 in 30 days. That's 1,667 words a day but hopefully I'll have days where I write more than that so I can get ahead. 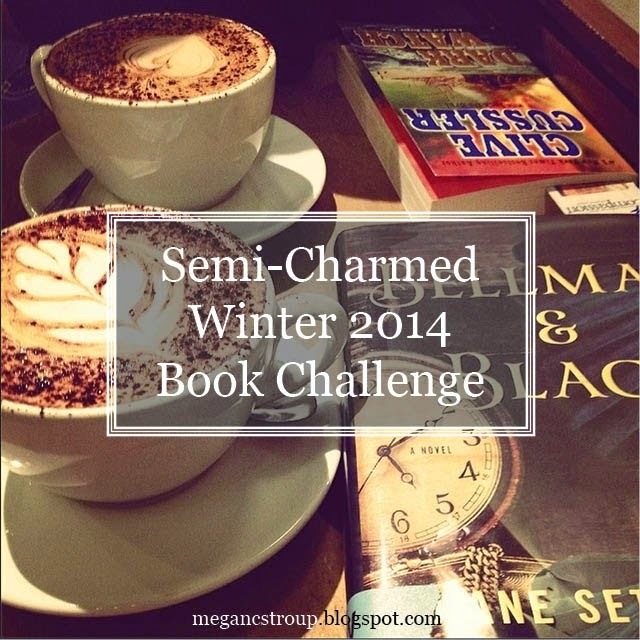 I also have the reading challenge(s) I'm participating in and have some projects coming up for HEA Ink. All exciting and then there's the fact that I think I broke my pinky toe. Swelling, bruising and pain like I've never felt after kicking my toe are all present. I was just telling someone the other day that anytime I plan to start the C25K something comes up and voila! That just puts my C25K on the back burner for 6 weeks and it looks like it might all just work out. I made some super cute green eggs and ham for a baby shower this weekend. The hostess went all out and it was such a cute party! What's new in your life lately?! 1. Florida Georgia Line's latest album. I've been listening to this thing on repeat for days and I can't get enough of it!! I cannot wait for them to headline their own tour! Also, because I ordered it from Amazon it came with this digital download and I can listen to it on any computer with my Amazon account. Bonus! I have a really nice pair of SUnglasses I got for Christmas last year, but they're aviator style so I can't push them up onto my hair and I hate that! 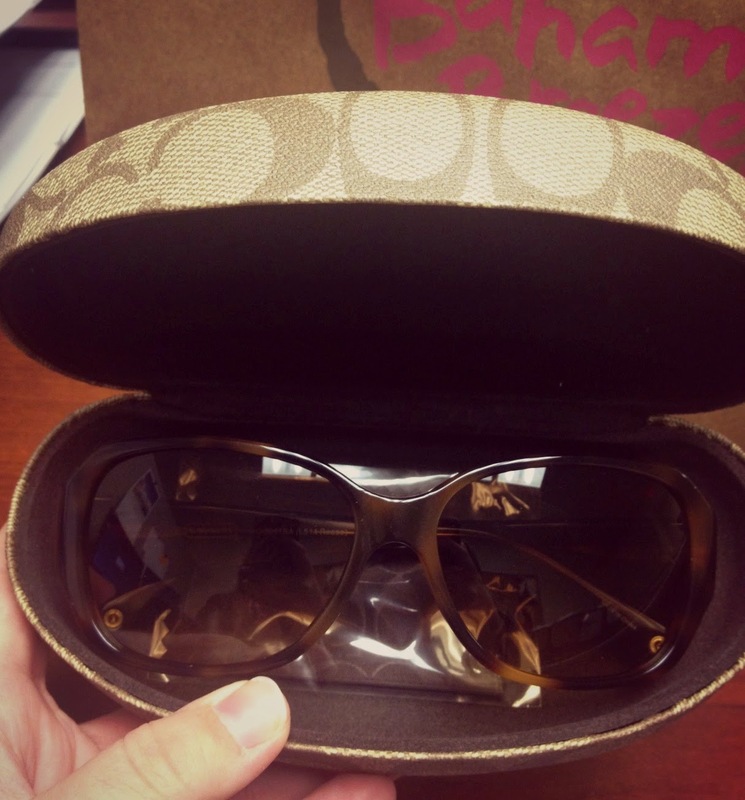 When the Coach outlet was having a super sale I purchased these bad boys and I'm in love! I've been known to stop at Starbucks multiple times a week and then the guy at the drive thru started getting creepy and petting my hand when he would hand me my card back. Needless to say I needed to find a different way to get my caffeine in the mornings. 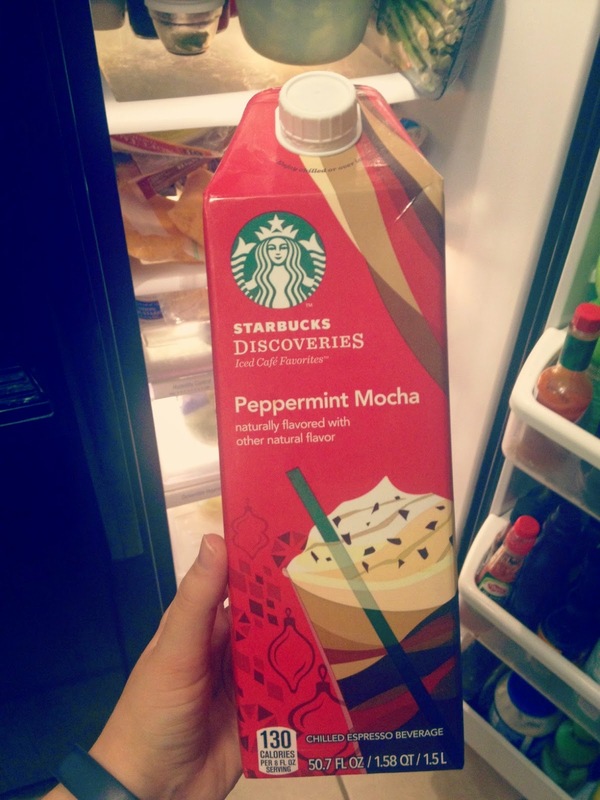 My mom found this at the commissary a few days ago and while it's not the same it's awesome and so much cheaper!! I used to have a dressy leather jacket, but I got rid of it before we moved to Florida because who needs jackets in Florida?! Well, now that I've lived down here for a while it does get cold to me, lol. 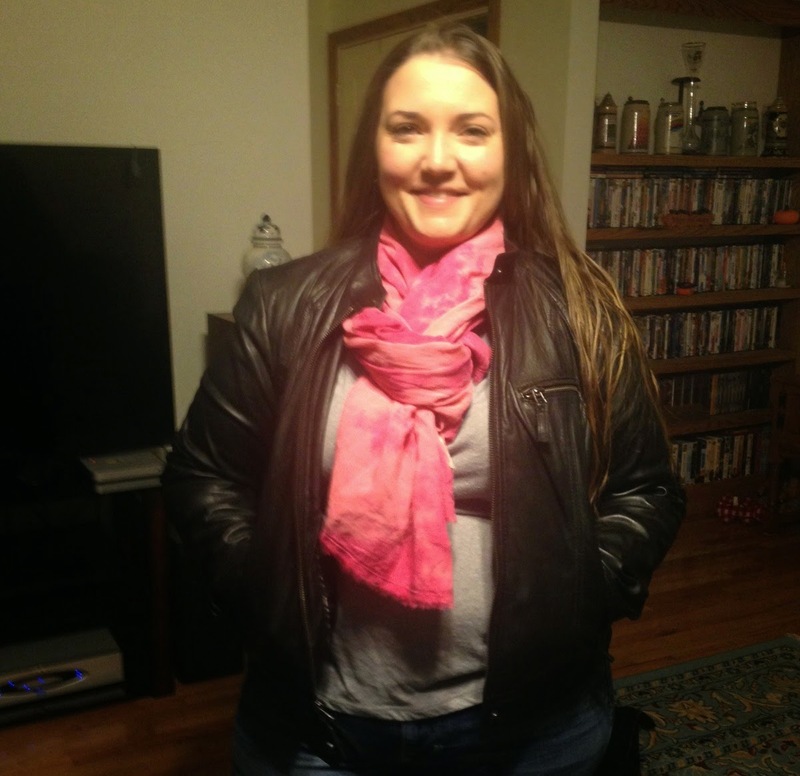 With my recent obsession with Sons of Anarchy it only made sense that I got a biker style! 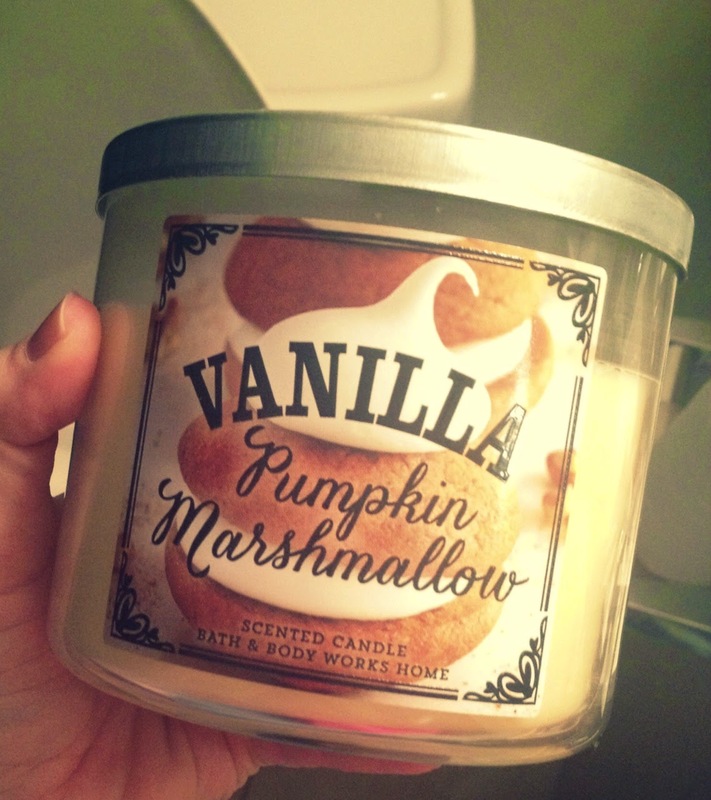 If you haven't smelled this candle you must make a stop in at your closest Bath and Body Works because it's ah-mazing!! What are some of your favs you purchased recently?! Welcome to the first of the #TBTHolidayEdition! One of my favorite Halloween traditions is pumpkin carving. I remember as a kid having the whole family involved in one HUGE pumpkin. As an adult, I've taken part in doing it with friends like last Halloween. 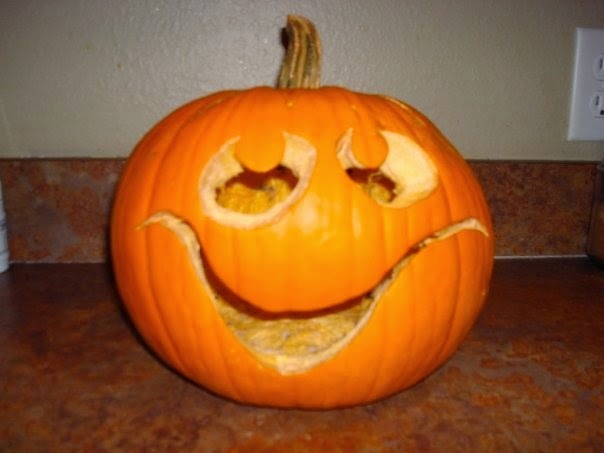 A couple of years ago (2008) one of the first friends I made when I moved to Florida came over and we carved multiple pumpkins together. 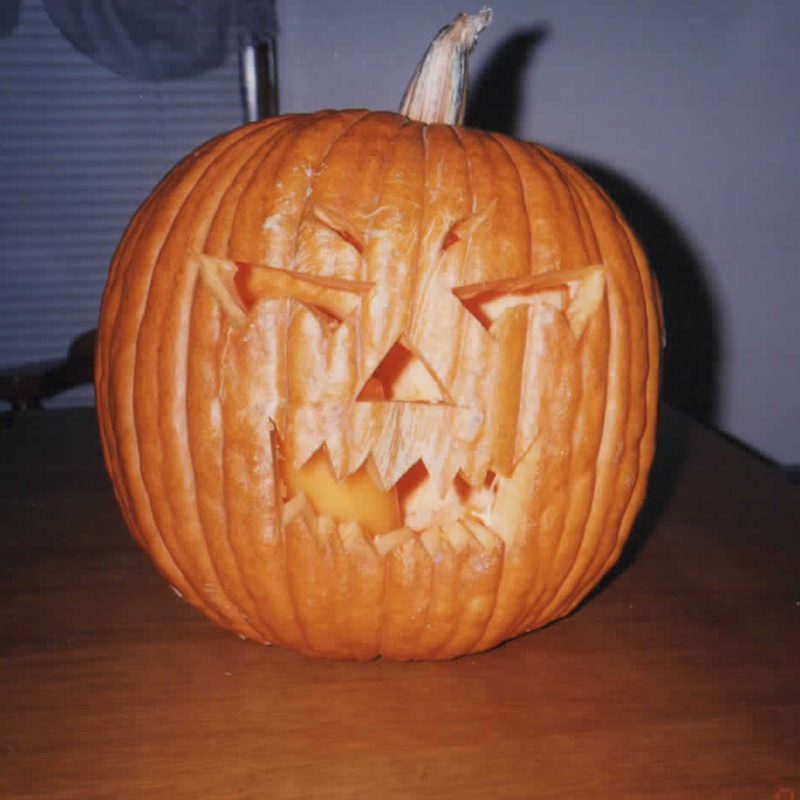 This was my first try at not just a traditional carving and I really need to step out of the box again this year. Let's jump back about 20 years. 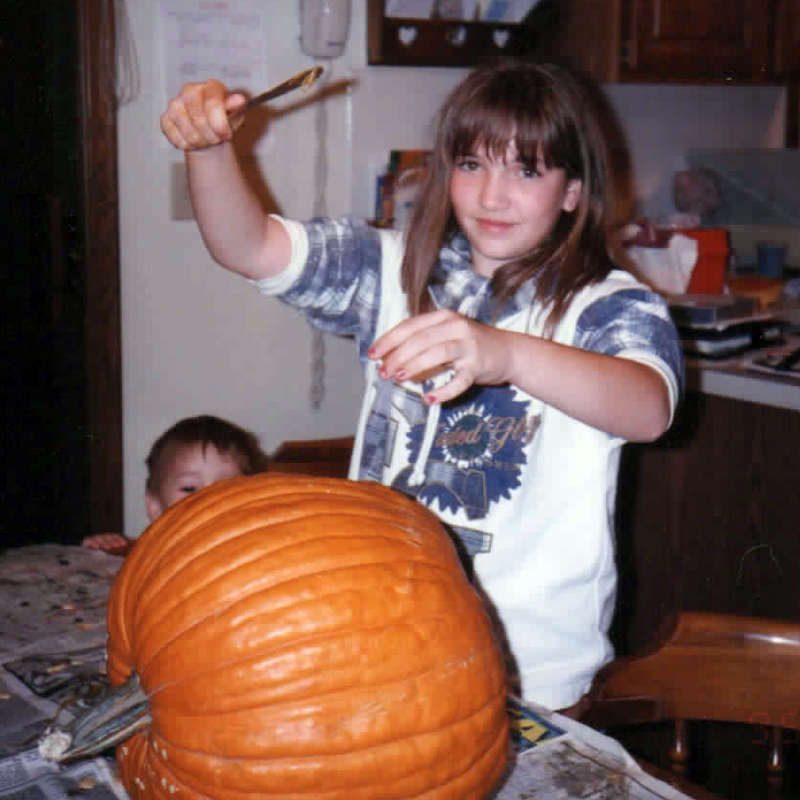 I think I'm about 10 years old in the picture below because you can see my little brother's head just over the pumpkin. He was sooo cute! I think for a 10 year old with the help of her family I carved a pretty decent pumpkin! 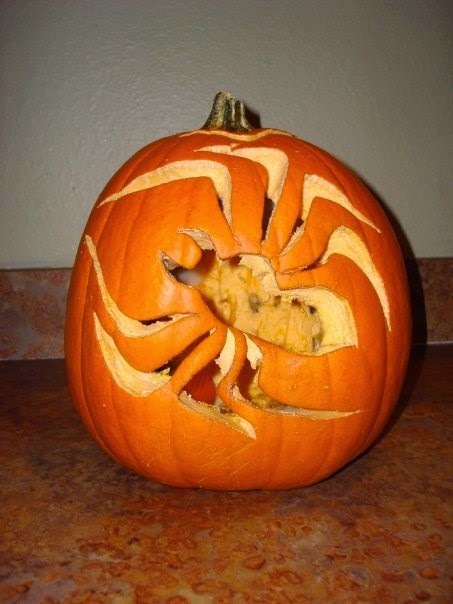 Are you planning on carving a pumpkin this year? Now it's YOUR turn to link up! 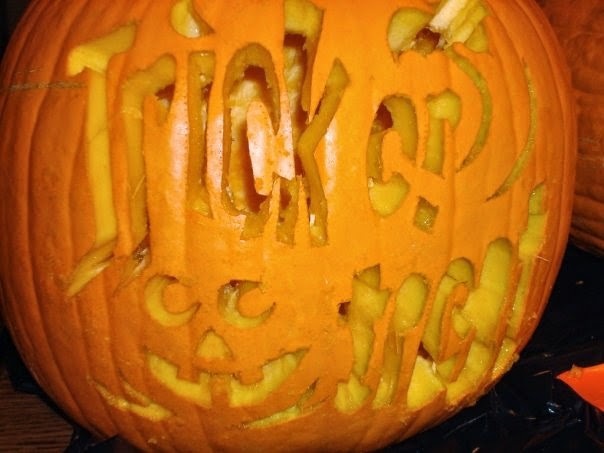 Don't forget to come back next week same day, same time and share another Halloween memory! Remember the only "rule" is your post must be a throwback post that fits the Holiday or time of year theme. Even posting stuff from last year is a throwback. 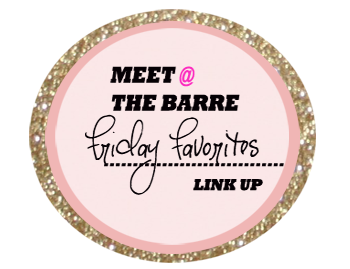 Of course visiting other blogs is the point of these link ups and I've love it if you mention and/or link back here for others to join! After seeing Kristen's post about the Semi-Charmed Winter Books Challenge I thought I would see if I could make it work with my 348+ books I "own" that I have yet to read. Yes, I finished my list of books I have I need to read before I spend more money or download more free books! If you're new to the challenge, the skinny is that you have from November 1st to February 28th to finish all of the books on your list / in the categories and earn points. 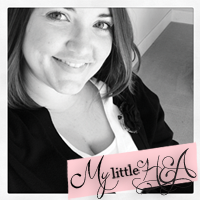 If you're new to MY BLOG welcome!! I'm an avid reader of anything with Romance/Love in it - this is a MUST in any book for me. Chicklit, New Adult, some Young Adult, other works of fiction and you won't see much else around here. This challenge will really be a stretch for me especially with a different genre and another language. I'm an avid Goodreads user, so we should be friends! This one will be whatever book I ended up "having" to read, lol. 10 points: Read a book with a food (not a drink!) in the title. 15 points: Read the first book in a series that is new to you (so no rereads for this one!). I'm consulting the interwebs for this and book blogger friends. Thanks to Brianna for this book, she had it on her list and it sounds really good! Plus they had it free at the library, so that's awesome! 15 points: Read a book written by a local author (either an author from your state if you live in the United States, or in your country if you live somewhere else—note: author must be from where you currently live). I need to read this before the next one comes out Dec. 2nd. It's a male librarian rawr!! 30 points: Read two books with a different meal in each title (e.g. breakfast, lunch, dinner, supper, brunch; update: meals like feast, banquet, picnic will also count, but try not to get too "creative" with your meal words!). Let me tell you I've been looking through all of my Goodread friends TBR lists and have found absolutely nothing that works with this category! The three or four categories with TBD are because I need to consult with friends to make sure I'm not stuck reading a book I won't like/be able to finish. 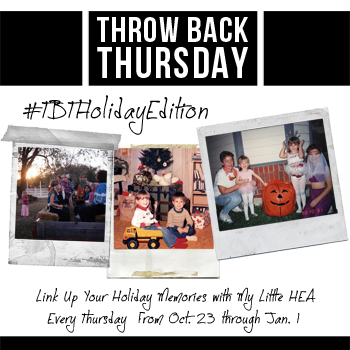 Don't forget to come and link up your #TBTHolidatEdition posts tomorrow! I think we went about doing London the best way we knew how. 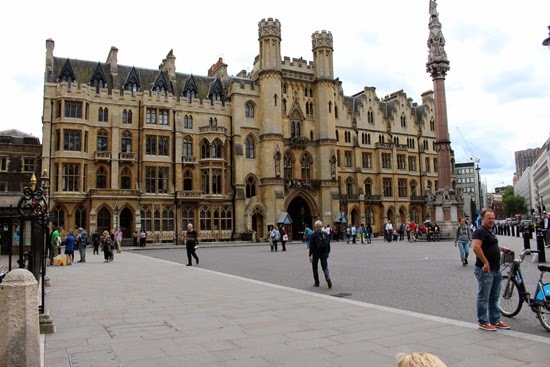 Start with the most touristy spots and then work your way out. Living in Florida, I'm surrounded by tourists more than I'd ever prefer, but it comes with the benefits those tourists are looking for. Sun, beach, Disney World, etc. 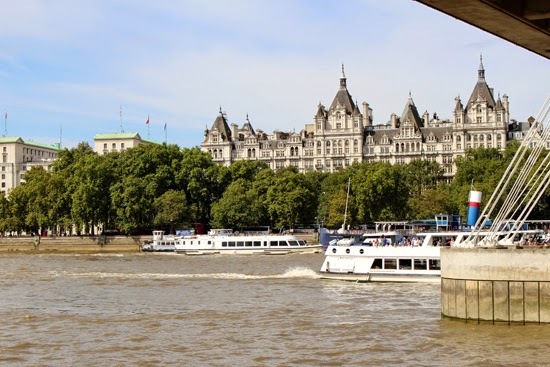 When I traveled to London, I knew it was a rainy city but the rain stayed away for us to have a perfect first day! Our flight arrived around 7 am Sunday morning, after we'd slept for a short while on the plane and enjoyed breakfast. First class had its privileges, the sleeping was one of them. After checking into our hotel we showered because airplane air, ugh! 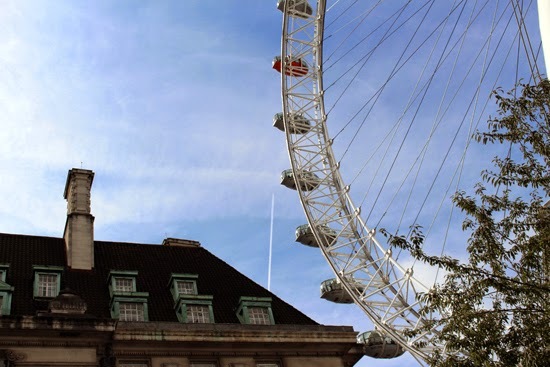 Then we set off toward the Palace, Big Ben, London Eye, they're all like right next to each other. 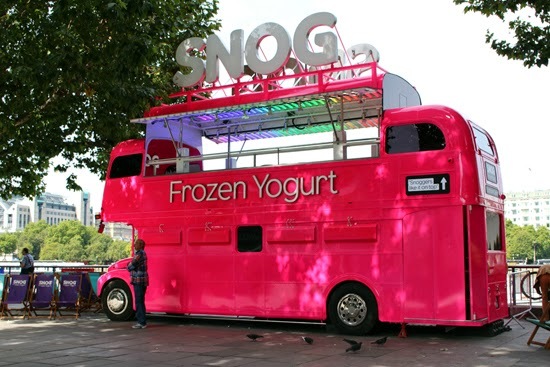 Double decker buses are one of the MAJOR things I think about when I think about London and what better way to showcase this iconic symbol than as a bright pink frozen yogurt shop! As we were walking around, getting our first feel of London I saw a ton of interesting art but I think there's enough for a whole post about that so you won't see any here. 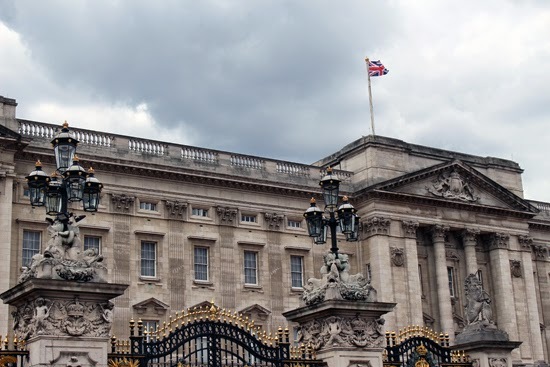 I did capture my first sighting of Buckingham Palace I think. 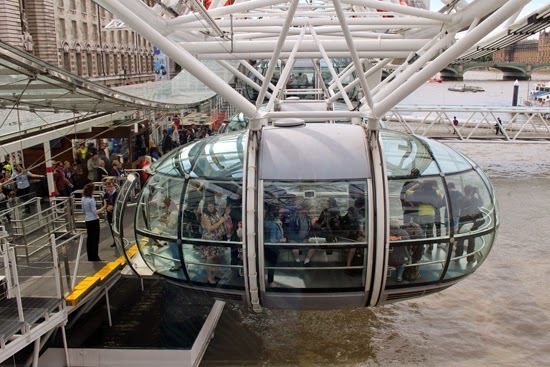 Then it was off to do the London Eye. Let me tell you, we paid way too much for this ride because we weren't interested in waiting in line but it was soo worth it for the photos I was able to take. This first shot was while we were standing in line and then the second one was the capsule behind us. The thirty minute ride seemed a little too long and they could have used more air conditioning. 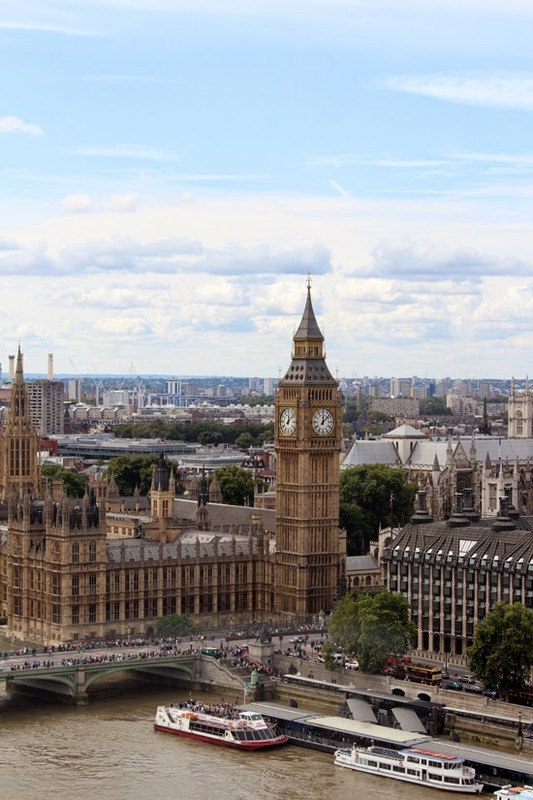 I took a bajillion pics of Big Ben, Parliament, Buckingham, Buses, etc. but I thought I'd just share the better ones. 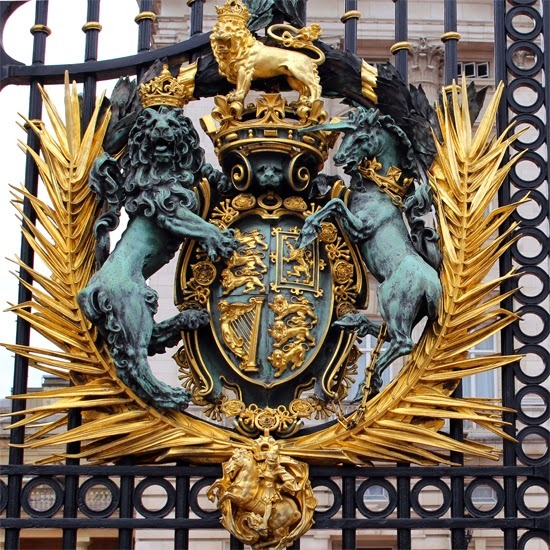 One of the things I was obsessed with before I even got to Buckingham was the supposed unicorns on their gates and OMG did they not disappoint! I mean, look at that unicorn! Sure, there's the lion and other interesting things going on in the details but I was mainly there for the unicorns. I didn't even think to look for the red hat guards, but from all of my pictures I couldn't pick out any so I'm not sure if they weren't in the area we were or what. I also became a little obsessed with taking pictures of the British flag. Not something I've ever taken a particular interest in before, but whenever I would see it on a building I would take several shots. 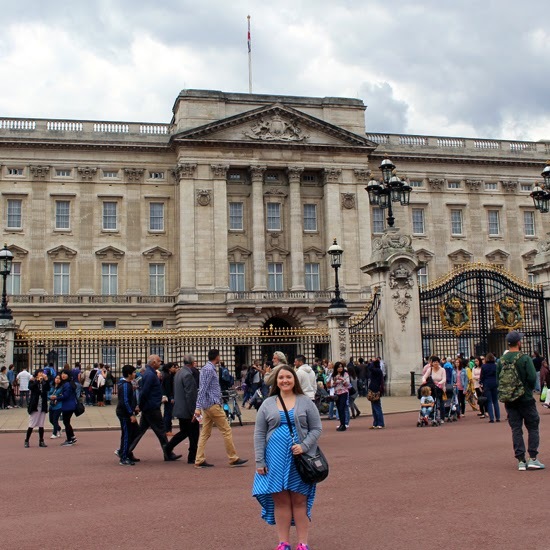 Then of course I had to get a picture of me standing in front of the palace or you know, it didn't happen! 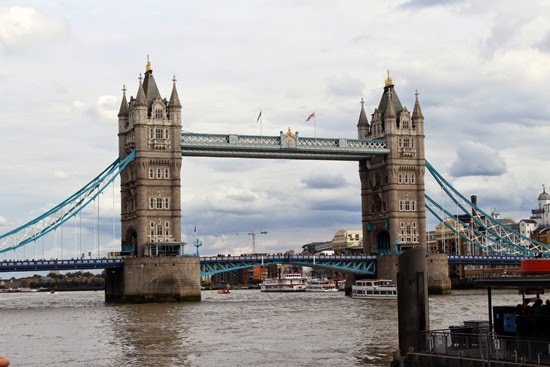 Our next stop was Tower Bridge, which I think a lot of people mistake for London Bridge like from the song. 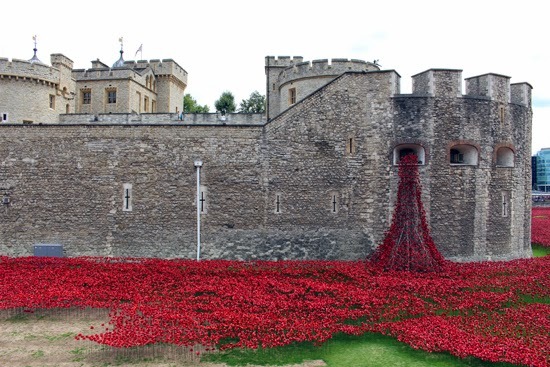 Anyway, I think the way they depicted the devastation that took place at the tower with the red flowers was amazing. While we were there they had tours you could pay for that allowed you to walk around down on the grass but even from my view point it was breathtaking. This was pretty much our last stop before we headed back to the hotel for dinner and drinks since our feet were killing us by this time. We talked about walking across the bridge but I really wasn't feeling like it. Then of course, the pic of me in front of it! 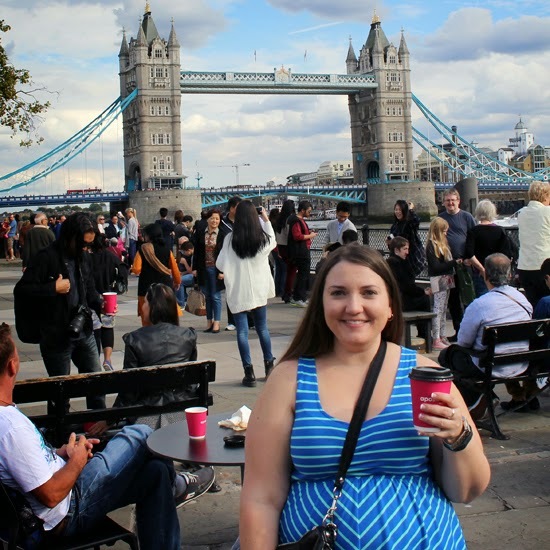 Of course these weren't the only touristy things we did, but they were the things I imagined we'd do on my list! We did go to Picadilly but there wasn't anything I had to take a pic of I don't think. I'll have to look through my stash again. When we tried to take pictures with the red phone booths they were dirty and had nudey pics so that was a big no! Do you usually to the touristy thing when you take a vacation? If so, do you space it out or get it all done in one day? I'm especially happy since I'm off work today and I've been working toward crossing things off my list!! Yes, I made an extremely long list of things I need to do over the next few days off but I'm already feeling like I'm getting somewhere! While waiting on my parents to arrive at the airport this morning, I already had over 100 books I've purchased (or bought free) on the list I own to read! That's not including paperbacks or any digital books from 2014. I'm wishing I would have been keeping up with this the whole time because it's taking a super duper looooong time cross reference with Goodreads and decide if it's one I really need to read or something I'm not really interested in. That's not what this post is really about though...it's about Throw Back Thursday and something that's been rolling around in my brain. I have so many pictures from Halloween and Christmas and probably a few from Thanksgiving so I thought every Thursday between now and January 1st I'd do a #TBTHolidayEdition what do you think?! Join in EVERY Thursday or whenever you can! October - 2 Opportunities to share you as a kid, teen or young adult in costume, pumpkin carving, trick-or-treating, etc. November - 4 Opportunities to share a Fall / Thanksgiving memory or maybe something or someone you were thankful for in your past. December - 4 Opportunities to share all of your Winter, Snow, Christmas, Hanukkah, Kwanzaa, etc. photos! January - 1 Opportunity to share a NYE photo! Please note this just to help you if you're stumped. We want to see your old throw back memories!! 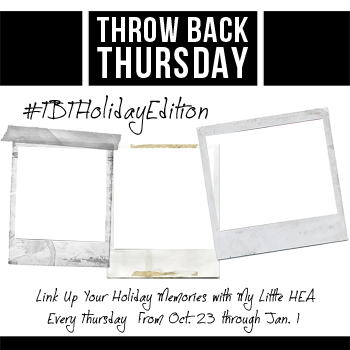 That's the whole point of Throw Back Thursday and make sure to save the images to your phone so you can share them on Instagram too!! I'm planning to schedule the post with the linky tools image option to go LIVE every Thursday at 6:00 am EST. Even on Thanksgiving and Christmas that are both on Thursdays this year, I'll be posting if you want to schedule a post too. I'm not a big fan of rules for things like this, but a like or a follow on Bloglovin' would be awesomesauce!! I've already started gathering my photos, but I have a few more I know I want to find. Hope to see you back here next Thursday!! P.S. 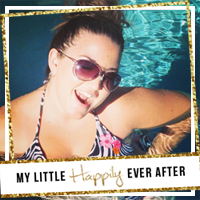 I made a transparent option if you want YOUR pics to show up in the button on your page! Have you ever had a plan to do something and then the time just flies by and you only get one or two things (or nothing) crossed off your list? This past weekend I had 5-6 things on my to do list and instead of crossing things off left and right I only got one of those things done. That's just not enough for me right now, lol and I think I need a little bit of accountability so I'm sharing my To Do List with you. I'm taking off Thursday and Friday this week and it's also my Monday off so I have FIVE whole days to get the following things done and then I'll share what I got done next week! I've been hanging out in Helene's Blog Consultations and have had to sit so the other participants don't see my messy room/office! How embarrassing. This has been on my list of things to finish for MONTHS. I've started and almost finished a couple of times, but this time I have a goal of purging since we're doing a garage sale in November!! This also includes hanging curtains and maybe some other things. 2. Design Project 1 + Design Project 2. 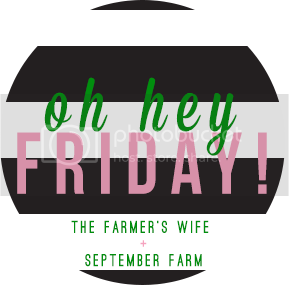 I have two different clients I'm working with that have something that I need to finish and I'm looking forward to getting those crossed off my list this weekend! I need to get to scrapbooking and I promised a couple of people that I would start sending out Birthday cards. I need to get them made!! This might be overly ambitious since I'll be cleaning my room/office as well but it needs to be done so why not cross it off my list?! I have piles of these around my room and bags of unread ones. I need to get a better system and I also want to make a lite of ETA TBR books for the rest of the year. Like when I'll be reading what I have and what is coming out. I'm really excited about doing this I've just been way too lazy to actually get it done. I have at least two other posts that need to be shared with a lot of pictures but I have to turn on my desktop for that and I just haven't been in the mood. I'm hoping this weekend comes with a lot of motivation!! I have an idea for a complete redesign that I want to start working on and after the design consultation with Helene and Sarah, I'm excited to start on it but I'm thinking I'll wait to share it after the first of the year. Kind of like a new year new me! I also have another idea I've been meaning to work on and I'm hoping to get started on that. I know, very vague but I'm doing it as a surprise! I've loved my Erin Condren planner, BUT I also like the way the Whitney English days are laid out hourly and have been working on merging my favorite parts about the two together so I can make my own planner! I just need to finish. I have pictures for both of these and I just need to sit down and write/schedule the post! Again...they're probably on my big computer so once my desk is clean maybe I'll get 'er done. Even with all of these to do things I'm expecting to enjoy myself. I just need to stop being a lazy bum. Amen? What do you do when you have an overwhelming list of tasks to complete? It's Monday and I got to work super early! With my parents out of town I had to take the trash and recycling to the curb. I also woke up early without an alarm because I was restless all night. It didn't help that a palmetto aka a giant roach woke me up yesterday morning early. Friday night, I did finish a really cute book that was a little dated maybe? I mean I lived in the midwest small rural town and I didn't feel like I was living in the old west. Know what I mean. 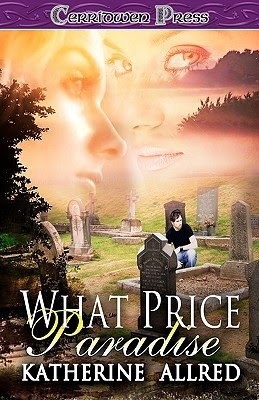 If that's something that would bother you this book might not be for you. Synopsis: All his life Tate McCullom has been taught to be responsible, and he is the very model of what a respectable man should be. Until the night he gets drunk and sleeps with a woman he barely knows. Now, six weeks later, she's pregnant, alone, and broke. Once again, Tate must take responsibility for his actions, and makes plans to marry his child's mother. There's only one problem...he has to tell his fiancée. Abby Grayson hasn't had an easy life. As the daughter of the town whore, people either avoid her or think she's like her mother. For Abby, it's a struggle just to fill her belly and keep a roof over her head. Loneliness and a secret yearning for this man she thought she'd never have led her to spend the night with Tate. But the last thing she needs is a baby when she can barely take care of herself. Desperate, but too proud to ask for help, she finally agrees to accept a job from Tate - the job of being his wife. Now she has almost everything she's ever dreamed of. 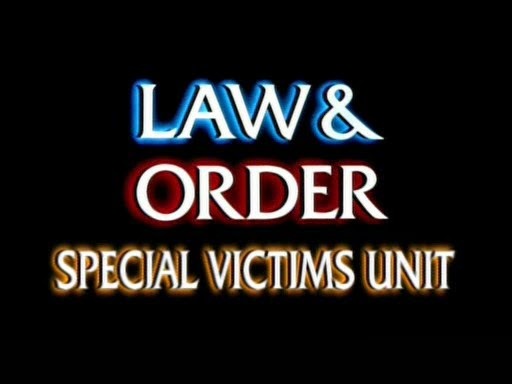 The rest of the weekend consisted of quite a bit of this. I did manage to get a night out with some friends at a beer place that also had Sangria so I was super happy!! I also got a little bit of shopping in for a baby shower I'll be going to in a few weeks.